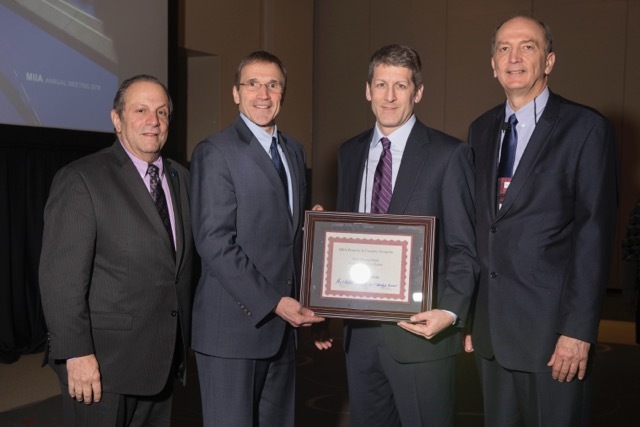 In recognition of its commitment to community-wide risk management through both individual departments and community leadership, the Town of Franklin has earned the "Community Excellence" award from the Massachusetts Interlocal Insurance Association (MIIA), the town's property and casualty insurance provider. MIIA presented the award to Franklin during the association's annual meeting in Boston on January 20th. "Congratulations to the Town of Franklin for demonstrating an enthusiastic enterprise-wide commitment to risk management and safety," said Stephen Batchelder, director of Claims Operations for MIIA. The town's Public Works and Facility Maintenance departments have proactively engaged in, and focused on, OSHA-related training and implementation of risk management best practices. Their collaborative efforts include comprehensive quarterly safety meetings in which they review and investigate all incidents, routine site and building inspections, and continue use of MIIA Rewards training. "This award is team effort and a testament to the hard work our town departments," said Jamie Hellen, deputy Town Administrator for the Town of Franklin. "Our staff at the DPW, Facilities, Custodians, Police, Fire, Library and Schools do a great job providing training opportunities for our employees to reduce work place injuries and accidents and provide a safe working environment for the community. It is also important to note their efforts have helped save the taxpayers almost $60,000 on our insurance premium for next year. These are the little things our staff do on a day-to-day basis that makes our organization function effectively. The town appreciates MIIA's support and recognition of the hard work our town departments put in." Factors considered to earn the community excellence award are solid implementation of risk management fundamentals such as on-going and effective safety committees, focused training, and a commitment to strong infrastructure and maintenance protocols throughout the entire community. In addition, awarded communities actively seek out new and creative ways to drive safety and mitigate risk. The Massachusetts Interlocal Insurance Association (MIIA) is the non-profit insurance arm of the Massachusetts Municipal Association. As a member-based organization, MIIA's only focus is to provide excellent service and quality risk management solutions to Massachusetts' municipalities and related public entities. Municipal insurance its only business, MIIA insures nearly 400 cities, towns, and other public entities in Massachusetts. For more information, visit www.emiia.org and www.mma.org.